Have you ever bitten into a plump, juicy strawberry that's been warmed by the sun? There's nothing quite like a perfectly ripe strawberry that has just been picked from the field! 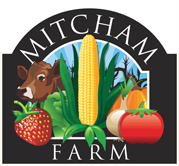 Visit Mitcham Farm in the spring to pick your own deliciously sweet, fresh berries! Picking your own berries is easy and fun, and it doesn't take long to fill a basket. Strawberries are a great source of vitamin C and low in calories! 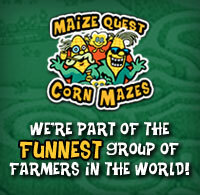 * For daily crop availability, check our Facebook feed or call (770) 855-1530. Specialty Items: We also have homemade strawberry ice cream, homemade strawberry jam, local honey, frog jam, preserves, salsas, some fresh produce (depending on availability) and other specialty items for sale at our Farm Stand. Our strawberry slushies are a favorite with our customers! Stop by to try one today! Other Things to Do: For the enjoyment of our guests we also have two family swings and a picnic area onsite. Visitors may also visit our farm animal viewing area. 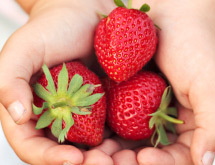 Twist your strawberries off the vine rather than pulling them OR gently pinch the stem of the berry at least ¼ inch from the berry between your thumb and index finger. Leaving a stem on the berry will help prevent bruising and help yuor strawberries last longer. Be gentle. Strawberries bruise easily. For jams and baking, pick strawberries that are a little more ripe and slightly soft. Don’t forget to look under the leaves to find hidden berries. To prevent bruising, don't overfill your containers or try to pack the strawberries down. The best time to pick in the morning or early evening to avoid any damage that the sun might to do you berries.